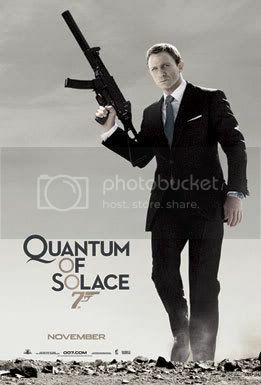 View Poll Results: How was Quantum of Solace (if you've seen it)? OK, the movie's nearly here (and out in some countries) -- let's focus on reviews and your views in this new thread rather than the one that started in 2007! Last edited by OldBoy; 11-13-08 at 03:46 PM. Where are there 2 reviews thread then? "Casino Royale" is one of my most viewed movies of the past few years and i can't wait for this one. i wish there was a little more girth to the running time, but beggars can't be choosers. It's a solid 7/10 film. I hope this is the end of this whole "Dark James Bond re-imagining" phase, though. Just because your film is "dark" doesn't mean it's better. I am ready to see more of the "James Bond" back in James Bond. Ebert gave it a 2 out of 4 (he gave Casino Royale a 4 out of 4), it's apparently the first negative bond review since Living Daylights. i thought this was a setup to a part III in the trilogy? that is what i heard anyway. Bond was not superhuman (as an earlier review in the other thread suggested) and actually took a pounding in this movie while giving as good as he got. I did like the openning title sequence overall but the transition to it was very sloppy. The same with the gunbarrel sequence which felt like a complete afterthought. Other than that, I'd gladly place this next to my copy of Casino Royale. And how I adore Olga Kurylenko! RT down to 70% compared to "Casino Royale" final tally at 94%. Where? Right here! Although this one was posted first so the other one should be deleted or merged. The other one has a better / easier to search for title though. I heard the next Daniel Craig movie takes place in outer space and has Herve Villachiaze as the henchman and Jill St. John as the girl. I was fairly surprised to see all the positive reviews for this film out there. Then I started reading them, and the praise isn’t exactly confident. I hope you lovely folk of the movie forum have more fun with the film than I did. Would it better if it was treated as say...an Action film cuz that's what it feels like. I mean it's a Bond film but from the reviews it sounds like a good action film, not a good Bond film. Does that make any sense? I read the plot summary at wiki and the story seemed pretty good. I will try to watch it before Thanksgiving. That sums up my thoughts perfectly. Ironically, this is the first Bond movie that I'm not really excited to go see in over 15 years (well, since the release of the second Dalton film), but my wife is excited this time (I think she's got a crush on Daniel Craig, go figure ), so we'll be there tomorrow night. Last edited by RoboDad; 11-14-08 at 11:26 AM. Damn... I never think before I post.